After building a strong foundation in Algebra I, you should be able to pick up, twist, and flip any sort of linear equation or function. Because these topics are much higher-level than back in pre-algebra, printable algebra II worksheets with answers are not as readily available. However, this section also includes resources for extra help with your algebra II needs–all free! 1. 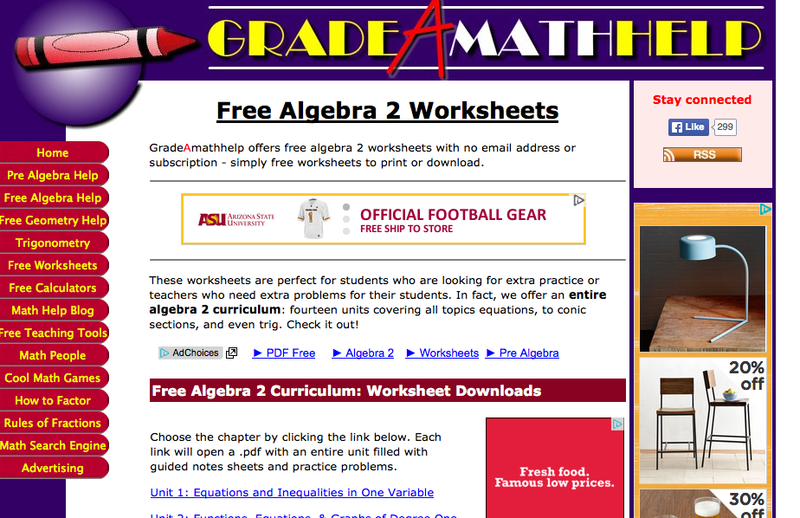 Printable Algebra II Worksheets: Math Worksheets Go! As mentioned above, Math Worksheets Go! breaks up Algebra II topics into multiple sections, each with anywhere between 1-15 associated worksheets. The worksheets are also easily downloadable and include answer keys and fully-worked-out solutions that show each step. While these printable Algebra II worksheets are NOT customizable, there are multiple YouTube tutorials available for each skill. 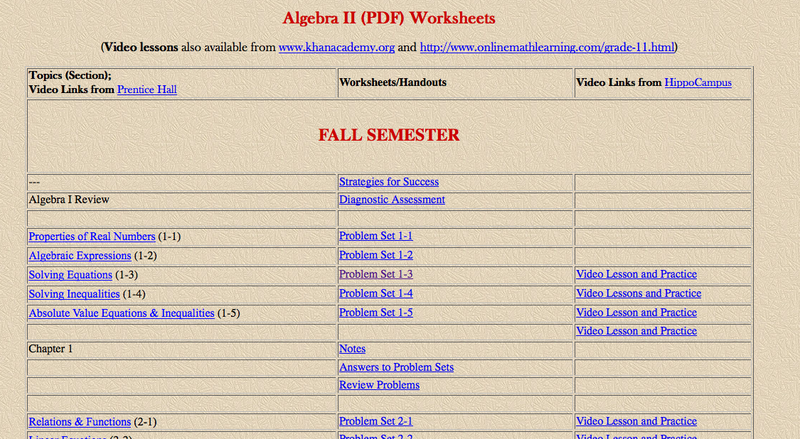 Looking for 14 units of printable algebra II worksheets with answers? Grade A Math Help is the place to be. Each unit is a PDF with thirteen days of lessons, and includes a quiz, an answer key, and a review. Each worksheet has different types of questions to answer, not just fill-in-the-blanks. This math help truly is Grade A. 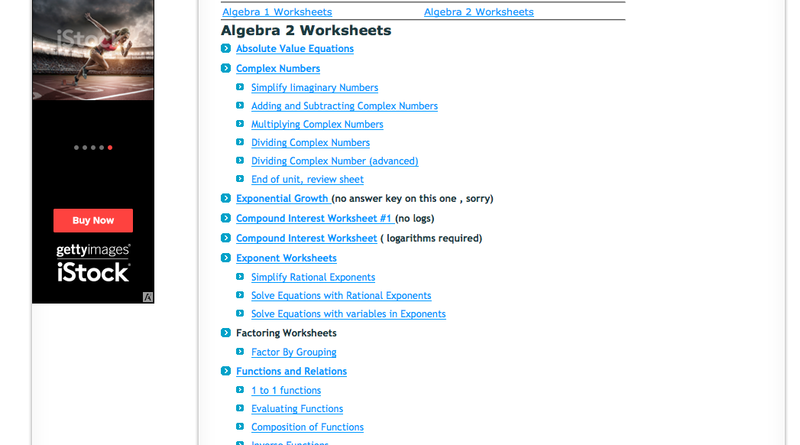 By far the least friendly interface of any of the worksheet websites listed here, Frankumstein still offers fantastic material for all of your Algebra II needs in individual “problem sets,” which can be printed out and used like worksheets. The answers to problem sets are provided in a separate link, and Frankumstein also includes video lessons and extra practice for each topic. I can’t recommend Khan Academy highly enough. They offer videos on every possible topic, and you can watch and rewatch to your heart’s content. The videos show them working out actual problems, not just offering general tips. 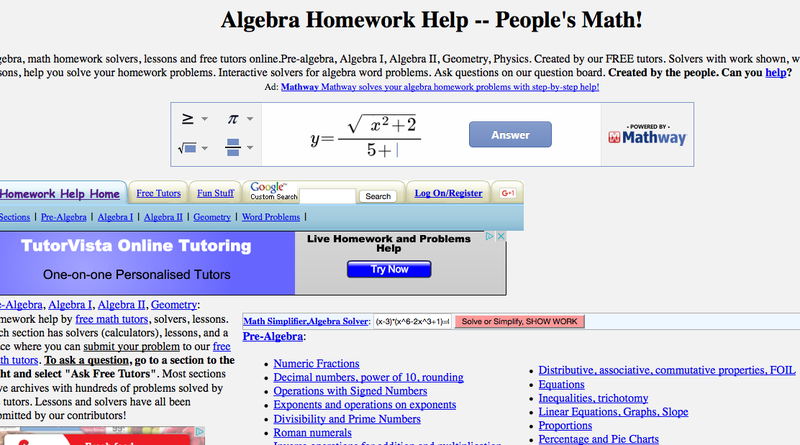 Plus, they’re one of the few websites that actually offers math help for free at an Algebra-II-and-higher level. If you’re struggling with Algebra at any level, Algebra.com is a gold mine. 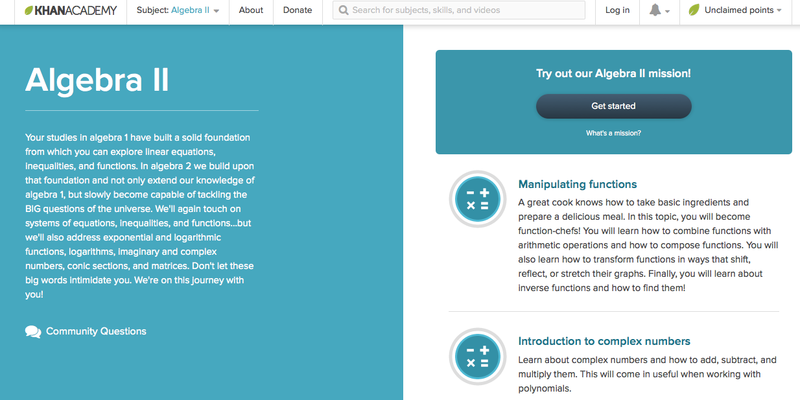 You have lessons, videos, and free calculators—plus, if you’re well and truly stumped on a question, there’s an entire community of free math tutors you can message and ask. It’s worth noting that you are limited to five free questions a day, so use them wisely! Students, raise your right hand and repeat after me. “I solemnly swear not to use Mathway to cheat on my homework, because then I won’t learn how to do anything, and I won’t build the math foundation that I need.” Good? Good. Now that that’s out of the way, Mathway is a free online calculator that will solve any algebraic equation. PLUS, it shows you how to solve it, step by step. Use this in situations where you’ve tried to solve an equation seven times, and it’s just not working, and you don’t understand what you could have possibly done wrong. No matter what kind of Algebra II practice you’re looking for, you’re sure to find something to suit your needs here. Which website is your favorite? Let us know in the comments!